Pin It, Do It: The Holiday Edition! 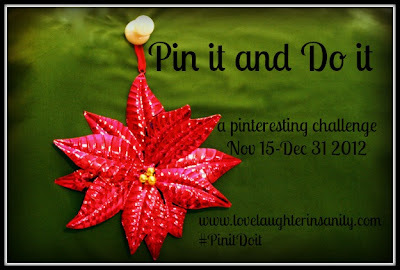 I’m very excited to be signing up for the latest edition of Trish’s Pin It Do It Pinterest challenge! I missed it the last few times it’s run. All the Twitter chat about it last month was so enticing, and with the holidays coming up, I thought joining the challenge would be a great way to motivate myself to actually do some fun crafty holiday things with Dylan, my nine-year-old. And look! I even created a special board just for the challenge: my Pin It Do It: The Holiday Edition! #pinitdoit board. See? I’m committing to this. I really am. I’ve vowed in the past not to participate in any more challenges, because I fail so miserably at them (in my first year of blogging here, I think I signed up for about twenty reading challenges – and completed only one of them (it was the Harry Potter challenge, and I did my reread in audio, so it was super, super easy). BUT! I have high hopes for this one. But this year? Due to some changes one of my major clients made, I have a lighter December schedule. And I fully plan to put the extra time to good use! What about you? Are you on Pinterest? Signing up for the #pinitdoit challenge? This entry was posted in Life and tagged #pinitdoit, Christmas, crafty stuff, holidays, Pinterest on November 15, 2012 by Belle Wong. Good luck. I did 12 Pins during the October challenge – so hoping to do as well this time around. Can’t wait to see what Pins you choose. Have fun with this. I’ve been a pin it / do it failure. Remember–you only need ONE pin to call this challenge a success!! Just one!! 😉 Hope you have a great time and thanks for joining. I didn’t reach my goal the last challenge, so I went with 4-7 pins this time. Good luck this time round. I’m going now to check out your board!